“Of course there were pirates,” she says. She’s quick to add that there is no direct evidence of ancient Maya pirates, but given how much valuable cargo was passing through these ports—and the fact that boats were often depicted carrying armed warriors—it’s a pretty good guess. Chances are, piracy started long before Europeans arrived. The presence of pirates of the ancient Caribbean might also explain the tall pyramid that could serve dual functions: for religious ceremonies and as a lookout. Vista Alegre had another quirk. In pre-Columbian times, the settlement was on a peninsula, with three sides facing the water (the bays on either side have since filled in) and an elaborate stone wall, probably topped by a wooden barrier, guarding the south-facing fourth side. But there appears to be no roads or settlements in that direction. Why build a wall if there’s no one on the other side to keep out? The wall was likely meant to keep out marauders who, worried about being spotted on the water, would land nearby and try to enter the city by land. Many of the sites along the coast have similar walls to Vista Alegre. The ruins of Isla Cerritos, 100 kilometers to the west, had a 305-meter wall that blocked the harbor like a giant arm shielding the city. 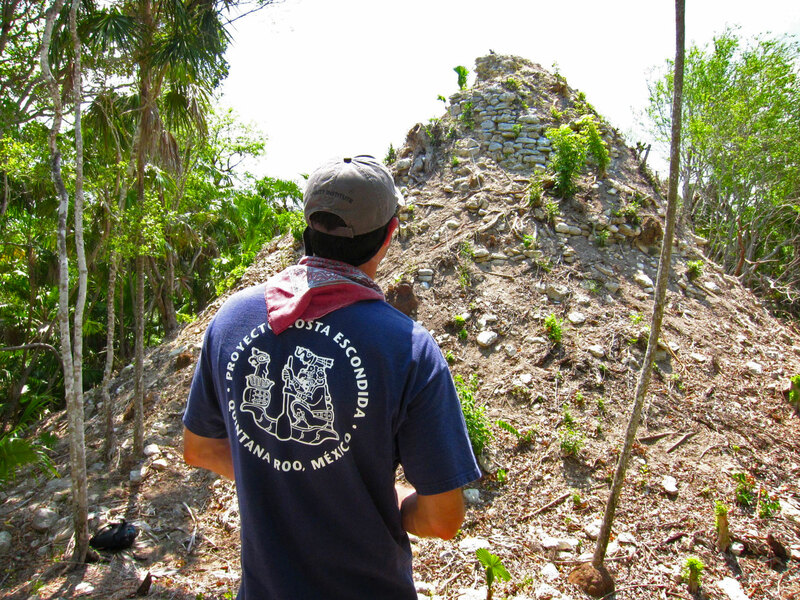 Beyond physical defenses, little else is known about coastal battles of the Maya world. Were there trained ocean fighters? Specially designed warships? Naval strategies? 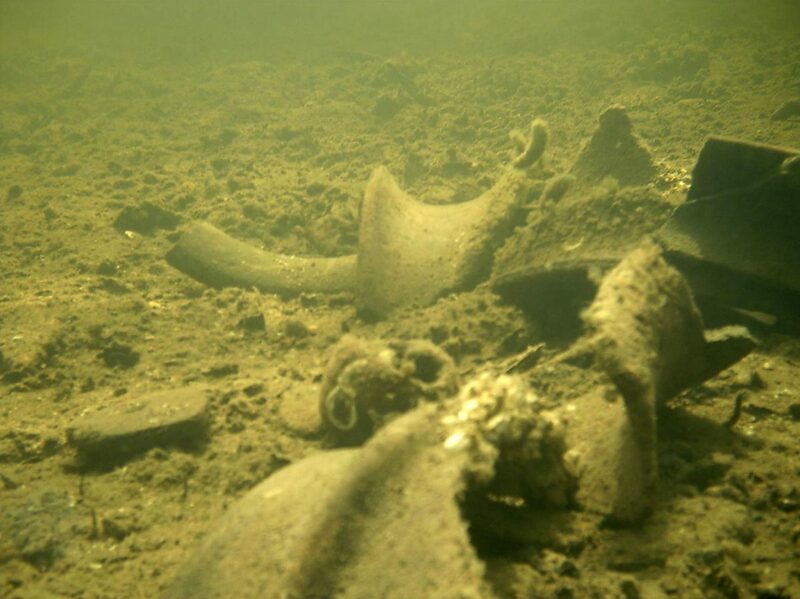 In fact, of the thousands of boats that once littered the coasts, all that has survived is a single canoe preserved in peat soil that dissolved almost as soon as it touched the air and a couple of paddles discovered in Belize. 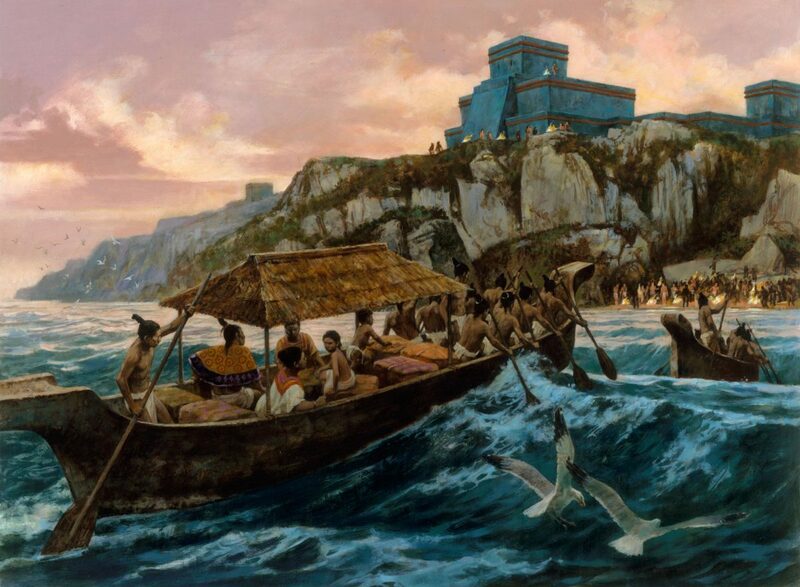 Yet, according to the first Spaniards to visit the coast, the Maya used many types of boats with up to 25 paddlers and capable of hauling over three tonnes of material, which is more than some midsize pickups can handle today. Some canoes may have even had sails. Several Spanish chroniclers describe seeing sails along the coast—there are no images, however, of sails among the codices and murals of the Maya themselves. Many local people still build traditional boats and even host international paddle races, but it’s tough to know what parts of these traditions are old and which are new. Modern Maya canoe builders have specific rules about construction. “For example, when to cut down the tree, which tree,” says Mariana Favila, an anthropologist at the National Autonomous University of Mexico, who is writing her PhD thesis on the maritime practices of the Maya, partly by spending time with modern indigenous communities. She points out that there are many traditions around boatbuilding that seem to predate Europeans, such as a ban on women being near a boat while it’s being built. Local tradition holds that women are associated with cold, whereas men are characterized by heat. Thus, for boats—which are also tied to cold—to stay afloat, they must be kept separate from women. 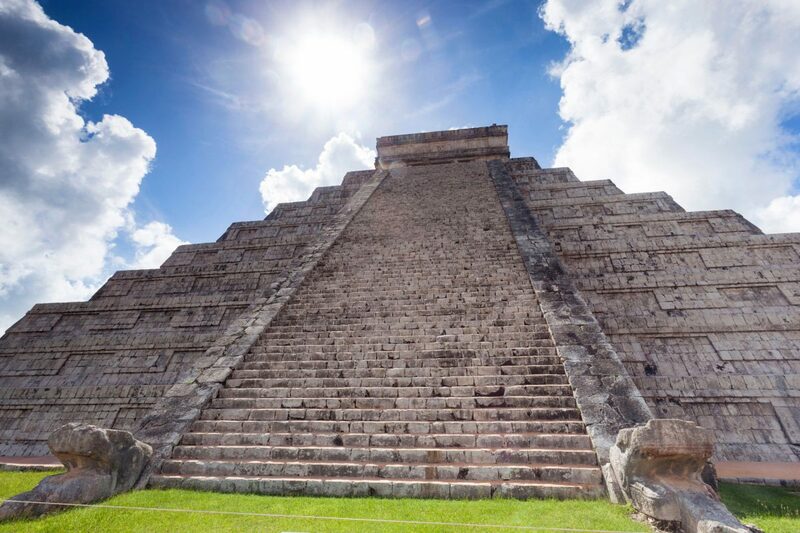 When most people imagine an ancient Maya city, they probably picture Chichén-Itzá with the commanding El Castillo at its center, surrounded by ball courts of varying sizes and wide plazas. But the sites we see today were the ceremonial centers of the cities, not where people lived. Studying a pyramid is like trying to understand the United States by digging up the Lincoln Memorial. It tells you something about values and traditions, but not daily life. For that, you need to see where the ancient Maya lived and worked. Modern satellite images and laser-guided surveys from planes have revealed that Maya cities were far more sprawling than anyone would have ever guessed. 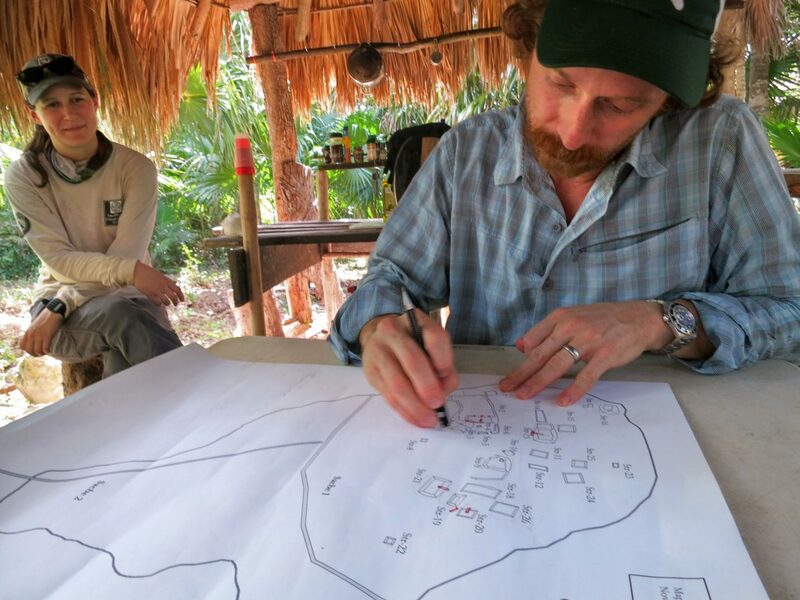 Earlier this year, a large multinational team announced that several cities in northern Guatemala once presumed separate were, in fact, connected by 60,000 previously unseen structures. Many of these were wooden houses built on low platforms. But, like giant, ravenous beasts, the tropical landscapes of the Yucatan and Petén Basin gobbled up all the wooden structures they touched, along with tools and boats. 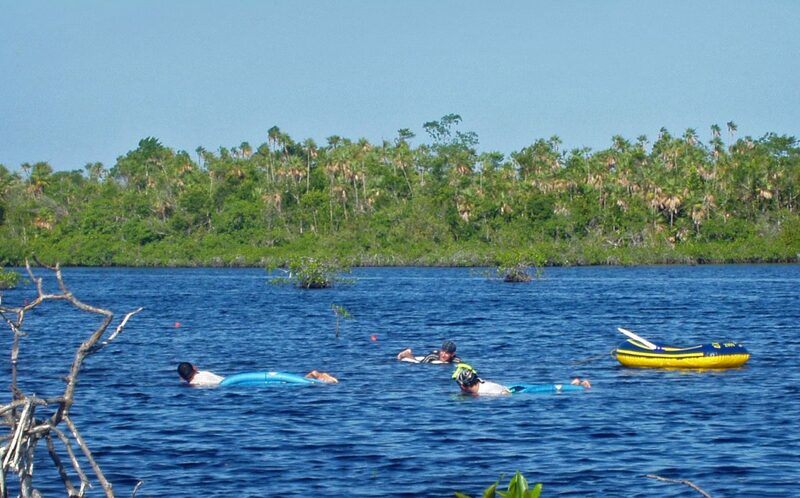 Except in one place—an ancient lagoon in Payne’s Creek National Park, a nature preserve encompassing savannah, tropical rainforest, and mangroves in southern Belize. Heather McKillop, an archaeologist at Louisiana State University, first came to Payne’s Creek in 2004 on an odd sort of archaeological scouting expedition. She knew that there had been settlements in the area and that the ocean had risen since then. So rather than shovels and pickaxes, she brought a swimsuit, a couple of buckets for specimens, and a vague notion that the rich lagoon soils were hiding interesting artifacts probably related to salt making. She and a few students waded into the water and quickly found all sorts of ceramic shards from pots used to boil briny seawater to collect salt and the occasional wooden stump—probably either a dead tree or driftwood washed in from storms. “Wood doesn’t preserve in the rainforest,” McKillop says. “I thought, oh they’re just old tree roots or they’re pieces of wood that have drifted in.” There’s no way they were left over from the Maya, that would be ridiculous. Termites, shipworms, or thousands of other creatures that scour the jungles and shores for detritus quickly devour wood here. But just out of curiosity, she and her students decided to dig up one. They took turns holding their breath, ducking a meter underwater, and scraping around the sides of the logs. The soil was a heavy sort of peat, covered in moss that was perfect for clutching while digging with the other hand. Finally, they got to the bottom and freed the wood, pulling it up to the surface. That same trip, they found more than a dozen sites along the creek and the first-ever intact Maya canoe paddle. Since then, McKillop and her team have found more than 4,000 such posts—perfectly preserved in the oxygen-deprived peat—in a five-square-kilometer area, using masks and snorkels while floating facedown on cleverly modified pool loungers. The sheer number of posts in such a small area suggests that the coastline once bustled with salt works. Salt is crucial to all civilizations, not just as food but also as a preservative. Experts always assumed the Maya collected it along the shoreline and passed it inland, but now they had evidence of whole communities dedicated to producing salt. No one knows for sure how the ancient Maya economy worked, but trade was likely crucial. Quetzal feathers (found in tropical cloud forests) came downhill, jade (found in the south) went north, shells went inland to the mountains of central Mexico, and obsidian (found in the volcanic spine of the continent) went to the flatlands of the Yucatan. There were no pack animals or wheels for carts, and boats packing a few tonnes of material would have been highly efficient. But not everyone is so convinced by this picture. 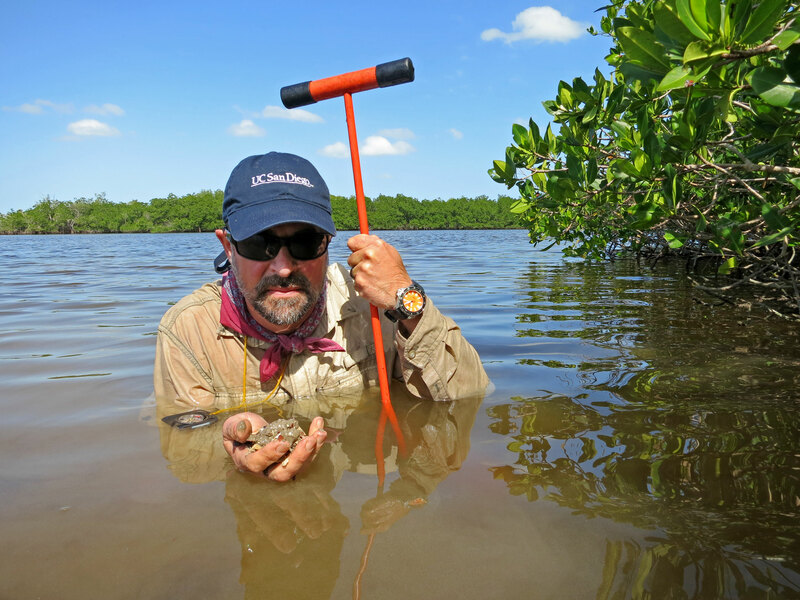 Rafael Cobos Palma is an archaeologist at the Autonomous University of the Yucatan with perhaps more experience investigating the coastal Maya than anyone else alive. He doesn’t see some kind of market-based trade but something more like a pipeline completely controlled by elites from Chichén-Itzá. He compares the gold and turquoise coming along the coast to Fabergé eggs created for Russian royalty during the turn of the last century. It’s not really trade if the materials go only in one direction. He admits that there might have been other, less-formal trade systems that siphoned goods to a few other cities, but insists this isn’t because of a market, it’s from leaks in the pipeline. 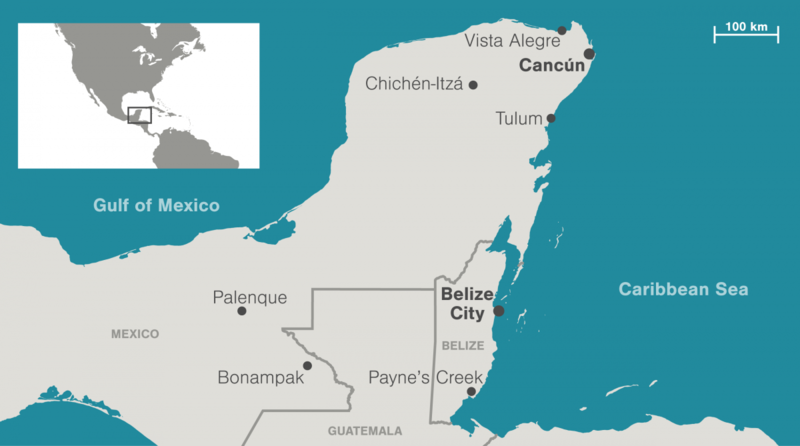 It’s a controversial idea, considering how long the ports operated and the variety of goods the coastal Maya moved and how different their culture seems from their inland neighbors. But it gets at a fundamental question about the ancient Maya. Did they have an economy the way we think of it—with currency, merchants, and markets? Or was it controlled by the iron fist of the state? Perhaps the answer lies in one of the many unexcavated sites along the coast, like Xel-Ha or Xcalak. There’s just one problem: many of these sites are underneath multimillion-dollar resorts. Ironically, the global fascination with the ancient Maya that puts pyramids on magazine covers and in Indiana Jones movies has helped fuel a tourism industry gobbling up wide swaths of the coastline, including many Maya sites. 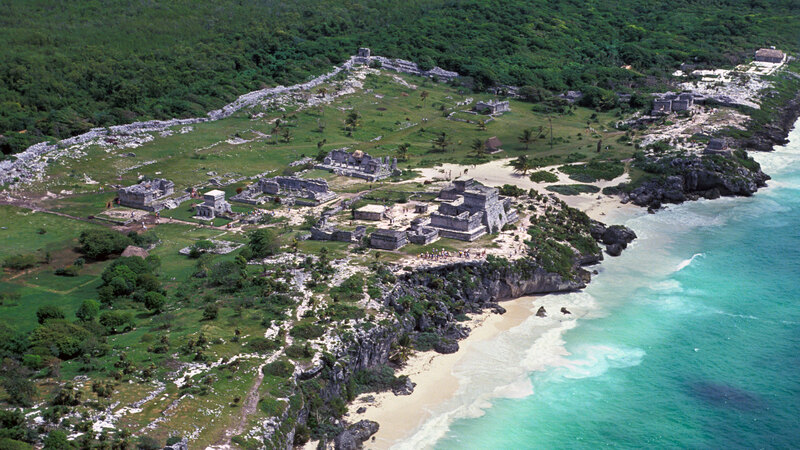 Xel-Ha, an ancient city north of Tulum, is now an amusement park, with playgrounds, rides, and concession stands. Others are in the middle of golf courses, and one, a rare cave shrine, is poking up through a Home Depot parking lot. When Rissolo wanted to see an important shrine at Xcaret, near Playa del Carmen, he had to buy tickets and walk past the souvenir shops and a dolphin tank to get there. Thankfully, many sites were visited and cataloged by archeologists before the all-inclusive resorts moved in, though most of these studies were just cursory. Still, someday archaeologists may be able to finish what they started. “The bulldozer might have destroyed one or two platforms here or there but there’s certainly more information. And fortunately, all that information is underneath,” Cobos Palma says. More destructive might be time itself. Cobos Palma points out that the coast of Tabasco, just west of Vista Alegre, is suspiciously short on ancient sites. The best explanation is that they have been buried under soil or rising seas. One of his research sites, Uaymil, was once on the coast but is now more than a kilometer inland. McKillop’s research area was originally on solid ground until the oceans rose up around it. Others could have been wiped out by a single well-placed hurricane. But there’s still too much to find to despair about what’s been lost. Some of the most important coastal ports may remain undiscovered. 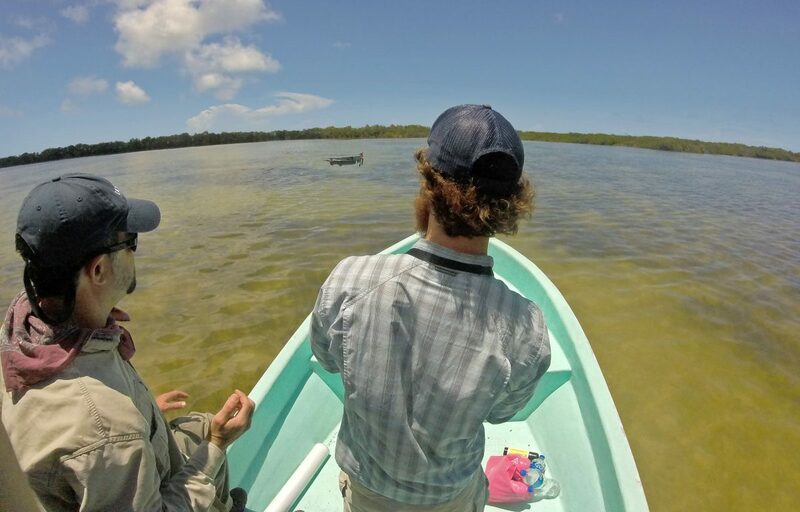 Back at Vista Alegre, far from the lively coastline of Cancún, Rissolo and Glover finish their survey, and we pile back into our skiff. Unlike the east coast of the Yucatan Peninsula, the northern end is nearly deserted. It’s a beautiful day, with enough wind to kick up some sea spray but it’s still pleasant. The previous week, the area had been buffeted by powerful winds as Subtropical Storm Alberto formed offshore and charged toward Florida. Roads in the area have been flooded for days and Cancún ground to a standstill. And that was just a small storm. Imagine a powerful monster like Hurricane Wilma—which devastated the region in 2005—and it’s easy to see why not everyone has embraced the coast. On the way back to the harbor, they decide to take a little detour. Locals say there is perhaps evidence of a settlement on the nearby island of Holbox, an emerging vacation spot for off-the-beaten-path tourists. One archaeologist documented the site in the 1950s, but no other scientist has visited the place. Rumor has it there are a few stone structures and maybe a shrine. Somewhere. Glover pulls out a drone and attempts to launch it. “We don’t even know if it’s in the interior. Is it at the edge of the mangroves? The coastline is just so complex,” Rissolo mutters. Glover eventually gets the drone airborne and battles the wind for a while, taking video he hopes will later reveal the site. It’s bizarre that there could be an undocumented ancient settlement 100 meters from our boat and we can’t see it. But then again, that’s the story of modern Maya archaeology. In recent years, the biggest discoveries haven’t been pyramids or kings but pedestrian things: ancient farm fields, roads, and salt factories. Seeing how the Maya constructed their civilization, in addition to their sacred buildings, has broadened our view of how their world looked. It was a world of mysterious ceremonies and unusual head shapes, but also one of people who were adept at getting what they wanted quickly and efficiently. Eventually the researchers give up—Glover is wary of running out of battery power and crashing the drone into the water. 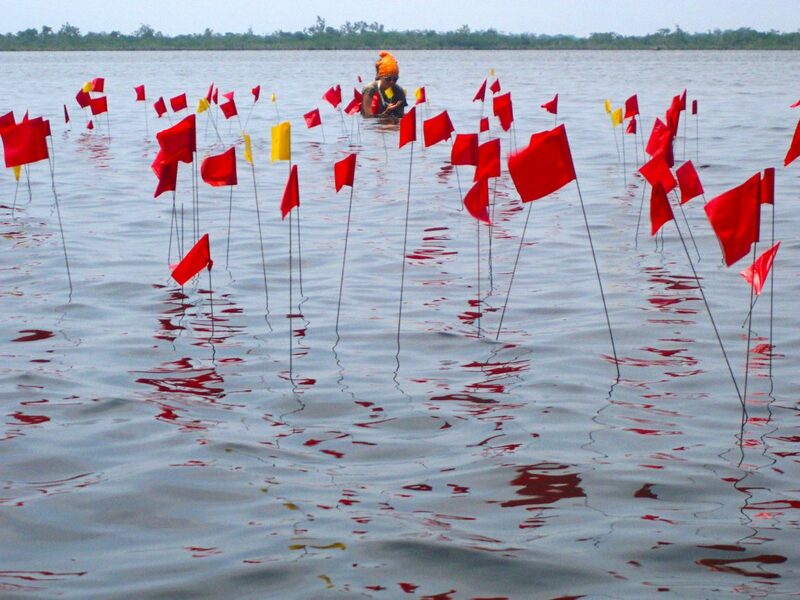 They agree to come back, perhaps with kayaks, and inspect the mangroves more carefully. They fire up the engine and motor toward the mainland. The clouds are almost gone, and tomorrow promises to be another perfect day in paradise. Boatmen will cart tourists to the island, just as they have for decades, while the fishermen load up their nets to leave at first light—just as they have for thousands of years. Erik Vance is an award-winning science journalist based in Baltimore, Maryland. His work focuses on the human element of science. Vance has written for dozens of outlets including the New York Times, Nature, and Scientific American. 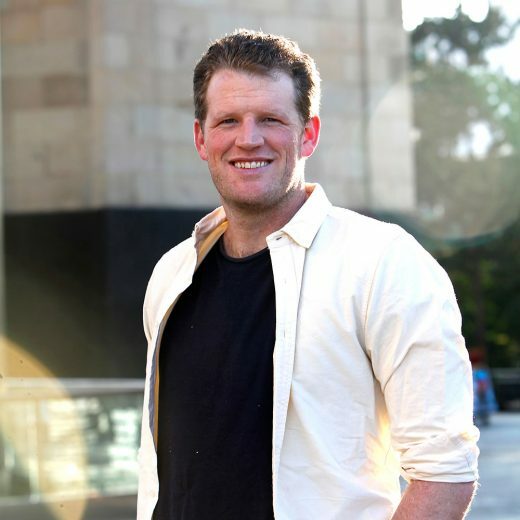 He lived in Mexico City for seven years and has worked extensively in Latin America and Asia, covering the environment and its effect on humans. His first book, Suggestible You, was published by National Geographic, in 2017. Cite this Article: Erik Vance “The Hidden Coastal Culture of the Ancient Maya,” Hakai Magazine, Nov 6, 2018, accessed April 21st, 2019, https://www.hakaimagazine.com/features/hidden-coastal-culture-of-the-ancient-maya/.